What is a slow project? And why does it matter how we define it? Russell Davies, a member of the London based Really Interesting Group (amongst other things), spoke at the Do Lectures about Slow Projects in 2008. 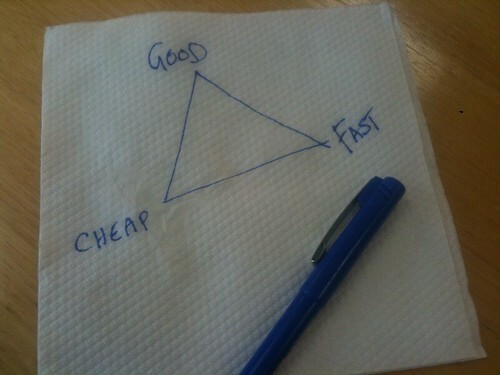 Essentially, he theorises that there is this ‘eternal triangle’ in projects: that you can do things good, cheap or fast – but only two at a time. As we evolve as humans, we are finding ourselves capable of doing much much more with our time than our predecessors. Clay Shirky calls this the Cognitive Surplus. Many of us are finding it obvious that we use this time to express ourselves in a creative capacity, to expand our boundaries, as it were. However, what’s different from previous times, is that we’re often doing this in a way that is beneficial to the planetary ecosystem. We do these slow projects because they are good for the soul of ones self, of others and of the planet. The world is growing ever more complex. Many of our traditional institutions are no longer providing functional solutions to these wicked problems we find ourselves faced with. What we will find, is that people who have immersed themselves in different slow projects, will have more resilient ideas about how to manage this complexity moving forwards. Good things take time, and some of the best things have become so good because they have been going for a while. Think about the things you enjoy doing, and think about why you enjoy doing them. Our own projects are going to take time to become that awesome. The idea of a slow project, is to be calm and ok with it taking that time. To be constantly moving closer to ones ambition is the aim. This blog is one such example. I’m very excited that, after 3 years, I have a subscription button! Please do subscribe up on the top right, and get these blog posts delivered to your inbox!